A crown, often called a “cap”, is a prosthetic cover that is placed over a tooth, after the enamel or filling has been reduced, and extends to the gum line. A crown is used to change the shape and colour of a tooth to improve a patient’s smile, or it may be necessary treatment for a tooth that has been weakened or damaged by fractures, decay, cracks, large fillings or root canal therapy. In this case, the crown covers and restores the clinical part of the tooth to its original, or enhanced shape, function, and comfort. 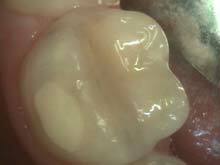 Two appointments are necessary to restore a tooth with a lab fabricated crown. At the first appointment, the dentist prepares and reshapes the tooth. An impression of the prepared tooth and surrounding teeth is made. The impression creates accurate working model of the mouth including the prepared tooth. The dentist then prepares a temporary crown and places it on the prepared tooth to protect the tooth between visits while the new crown is being crafted. At the second appointment, approximately one or two weeks after the first appointment, the temporary crown is removed and the permanent new crown is inserted. The bite, fit, shape and shade are checked for appropriate function and esthetics prior to final recementation. The bite will be adjusted, if required. The crown will be shown to the patient prior to any final cementation to ensure that the patient is happy with the final product. There are several types of crowns. The type of crown that is required on recommended is dependent on certain factors, such as the “bite”. The dentist will discuss these factors with the patient at the appointment to determine which one best suits the situation. Study models and photos may be required to properly treatment plan the area(s) and clearance between the upper and lower teeth. Materials that are available are: all Ceramic (cerec), gold and porcelain fused to metal, all porcelain (Procera). Care must be taken to avoid fractures and with good diet and oral hygiene, a crown may last a very long time. However, the average longevity of a crown is around 12-15 years. 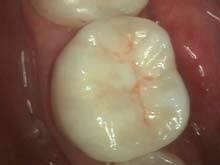 Your gums and teeth may be very tender after single or multiple crown preparations. There may be some tenderness around the gum line or at the injection site. Please place 1 tbsp. salt with an 8 oz. glass of warm water. Rinse your mouth several times a day the first few days after treatment. Peridex or Perio Plus oral rinse may also be prescribed as an anti microbial rinse to be used two to three times per day. When brushing, use a soft bristle toothbrush. Gently massage gums and teeth. A power toothbrush may also be gently used. Stay away from sticky foods (gum, taffy, etc) and avoid chewing ice, nuts, and hard candy. If your temporary crown should loosen or come off, please call the office to have it recemented. As a temporary measure, place some toothpaste or Vaseline inside the temporary and place it back on the tooth, if possible, until you are seen in our office. There may be temperature sensitivity on a “vital tooth”, or a non-root canal treated tooth. If the nerve or pulp of the tooth is unhealthy or stressed, the tooth may become more sensitive. If the tooth does not settle down after the initial tenderness, please contact our office. Dr. Kokonas is pleased to offer the service of custom shading to you. We want to offer you the highest quality of dentistry, and this is one way we do that. Teeth have a variety of shapes and colors. In one person’s mouth, there can be a variety of shade….even on one tooth. When we fabricate crown, veneer, or bridge for you, we choose the predominant shade of your tooth. Then we take digital photos to send to the lab. Sometimes even though we do this, the colour isn’t 100%.